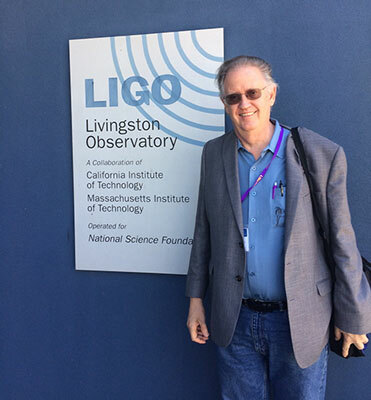 Well we have had a wonderful time at the Gravity Wave and Astrophysics symposium in Baton Rouge and included tour of LIGO Livingston Observatory. We flew back to OC with the expectation that the fires on Mt. Wilson would not interfere with our planned observing night at the 60-inch telescope, but again, the third time now, we have been canceled out because of the ongoing fire. Darn! OCA Tour Coordinator, Michelle, has done a valiant job in trying to keep our observing group together of these cancelled opportunities, and here we are again, cancelled. Thanks for that, Michelle! Luckily we can report on the successful LLO tour and some of the symposium discussion of GW170817 and the beginning of the new multi-messenger era in astronomy. But first, there is another upcoming meeting on the calendar that some of you might be interested in and that is the American Association of Variable Star Observers (AAVSO). Their 106th fall meeting will be held in Nashville, TN, on November 2-4. Unfortunately, I can't make that meeting, but was successful in convincing Resident Astronomer Peggy that we should attend the 2018 annual meeting, November 15-17, to be held at Lowell Observatory in Flagstaff, AZ. This meeting is a great excuse or reason to attend at that time and see the forest and mountains and the historic Lowell Observatory at the same time. It's on our calendar so see you all there! 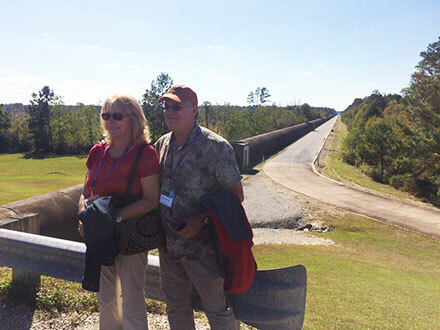 Now, one of the benefits of attending the symposium in Baton Rouge was a chance to have a tour of the LIGO Livingston Observatory (LLO). The other US based LIGO observatory is located in Hanford, WA and the Virgo LIGO just came on line near Pisa, Italy. 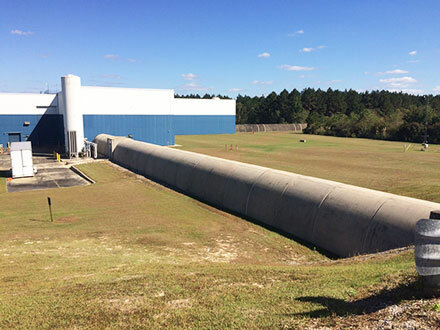 There are other LIGO facilities under construction, KAGRA in Japan, and another one in India. The LIGO O2 observing run has been shut down for installation of scheduled improvements in sensitivity so they didn't mind all of us wandering all over the place. Actually, they have tours all the time, but even us serious enthusiasts and scientists were not allowed into the heart of the interferometer and vacuum arms, which are maintained as a super clean room type of environment. The LIGO stainless steel vacuum tubes are installed in a protective concrete tube mounted on the land surface. We did get to go into the control room and see some of the displays used to monitor the status of this very complex scientific machine. Remember that LIGO is short for Laser Interferometer Gravity-wave Observatory, and the 4-kilometer arms form a very sensitive optical interferometer. We had dinner with some of the scientists who maintain the system and they told of the many disturbances that can through the machine out of alignment. The LIGO has something like 65% availability duty cycle and various events, not just equipment failure, but storms, earthquakes, nearby logging operations, the usual freight train that passes nearby, all can cause the interferometer to lose lock and have to be shut down and then re-aligned and restarted. Pretty complicated stuff to measure such small strain signals caused by the passing gravitational wave. LIGO has been under development for close to 40 years and those folks that argued on behalf of continuing the development at NSF and elsewhere are certainly to be congratulated. 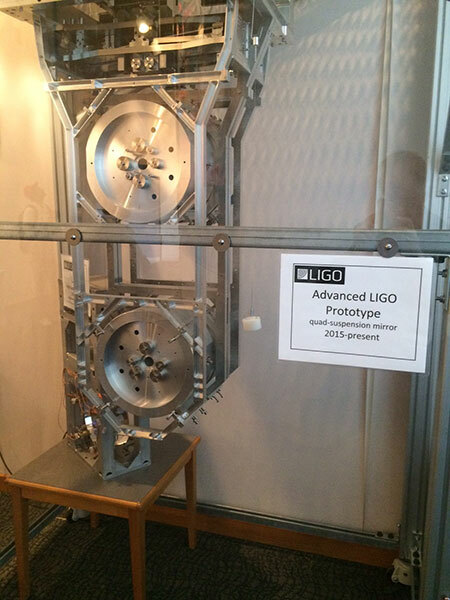 Many key technological advances in optics had to be invented and developed and installed in LIGO in order to keep the quantum optical noise low in the system. Also being considered for the next upgrade is a new technique involving "squeezed light" is used in combination with the Heisenberg Uncertainty Principle to increase the noise in one direction while minimizing it in phase, which is the key measurement parameter. Another major noise source which must be controlled is seismic noise which is generated by storms, earthquakes and vehicles. One example of the seismic isolation necessary is shown in this photo of the mirror suspension and isolation system. This photo does not show enough of the detail and the fine fiber suspension that is used to suspend the mirrors in a nearly free-falling reference frame. Just in case you haven't seen any of the images of the location identified for the neutron star merger event, the following shows the neighborhood around NGC 4993. You can see the transient nature of the merger in the sub images before and after the event on August 17, 2017. This image shows what is identified as AT2017gfo, which is the near-infrared counterpart of the gravitational wave source, GW170817 and gamma ray burst counterpart, identified as GRB170817A. 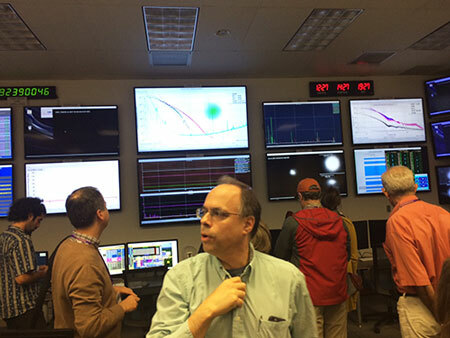 When LIGO detected the gravitational waves from the binary neutron star merger, many other observatories were alerted and the beginning of multi messenger astronomy began. Last weeks post described how the gamma ray emission from the merger was detected just 1.7 second after the arrival of the gravitational wave from the 40 Mpc distant merger. This event was relatively close by and might not have be heard if it were say twice as far away. But with the new improvements being installed in LIGO now it should be easy to hear similar sized events at that distance. Keep in mind too as the sensitivity to GW is doubled, the size of the universe that can be studied goes up as the cube of the distance, or eights times. The other electromagnetic counterparts, including x-rays, showed up many hours and even days later than that, which is why the advanced event notice from GW is such a key new tool in astronomy. Neutrinos also can be studied as a counterpart of the merger event through land based observatories like ICECUBE in Antarctica. The image below shows the optical spectra of the merger beginning on August 18 and continuing through August 27. You can see the transient nature of the electromagnetic (light) signature and how important it is to point the optical telescopes at the event as soon as it is detected. 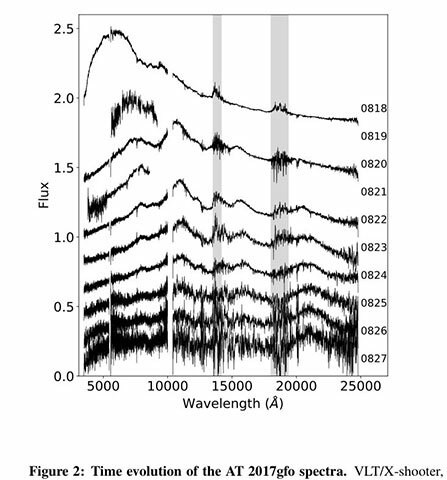 The previous spectra are thought to be the result of radioactive decay of all of the new elements formed during the merger, which is often dominated by the ejection of elements heavier than Lanthanide, and are therefore described as lanthanide-rich ejecta. 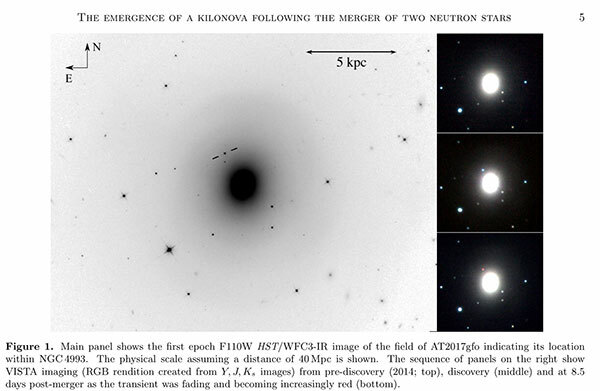 One of the more interesting astrophysical findings was further confirmation that most of the heavier elements are made in neutron star mergers rather than as previously supposed in massive star supernovae. 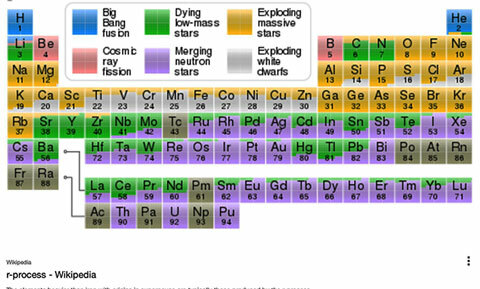 The periodic table below shows the current understanding of how the elements were formed. A key concept in nuclear physics that describes this process involves the density of neutrons that are available and the amount of time during which the neutrons are confined during these very explosive astrophysical events. The key nuclear process is called the "r-process" for rapid process as compared to the "s" or slow process. One of the best presentations that gave an overview of this new multi-messenger era of astronomy was the one provided by Brian Metzger, Columbia University. 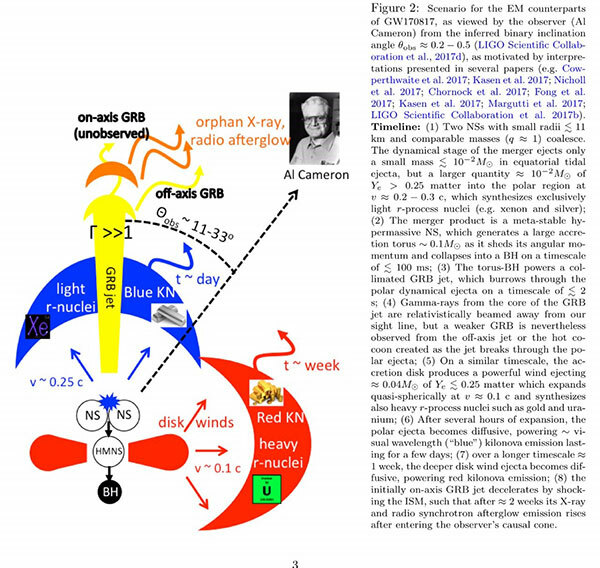 The following cartoon from his paper illustrates how the physics of the merger and the resulting element formation and emitted radiation depends on the orientation with the orbital plane of the binary neutron stars. Without the detection of gravity waves, which enables the orientation of the orbital plane to be identified, it has been much harder to understand what is seen in the optical wavelengths because what you will see depends on the observers orientation. Note how the merger process itself generates different levels of light r-nuclei or heavy r-nuclei depending on the physical orientation with respect to the orbit of the binary stars. Gravity wave detectors can measure the polarization of the waves and from that the orientation of the binary stars orbit can be determined directly. Note also how the times at which the multi-messengers appear to the observer, from seconds to days to weeks, can all be explained by the process and the direction of where the ejecta appears and how it interacts with the environment around the merger location. The impact of how GW will affect the growth of astronomical understanding is just now starting to occur and the combination with multi-messenger data collection will allow deeper insight and understanding of what goes on in these very energetic processes. Also since gravity waves fall off in amplitude inversely with distance and not with distance squared as light does, they offer new more independent methods to determine basic astronomical parameters like Hubble's constant. Pretty neat! If you want to get more into the details, look up any of the referenced papers. 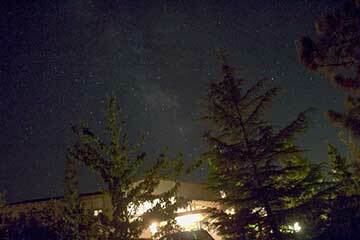 cosmology huh? had to search this term on internet since i had no clue. i should really look around to new world theories and look more into this palmia observatory.